Livorno (also known as Leghorn) is the primary port for Tuscany and thus the jumping off point for excursions to its more famous inland neighbors Pisa and Florence. The city was begun in 1017 as a fortress to provide protection for Pisa. However, it did not begin to emerge as an important port until Florence purchased it from Genoa in 1421. After that, the city received attention from the Medici rulers of Florence who saw Livorno as an alternative port to Pisa, which was losing access to the sea due to the silting up of the River Arno. In 1580, Livorno was designated a free port, which attracted foreign traders. A policy of religious tolerance also helped lead to the growth of international communities. In particular, the city developed strong ties with Great Britain. When Livorno was occupied by Napoleon at the beginning of the 19th century, trade with Britain was halted. This began an economic decline and a shift from commercial trade to industrial production. In 1865, the important Orlando Shipyards were begun. Because it was a major Axis port, Livorno was bombed extensively by the Allies in World War II. As a result, most of its historic sites were destroyed. 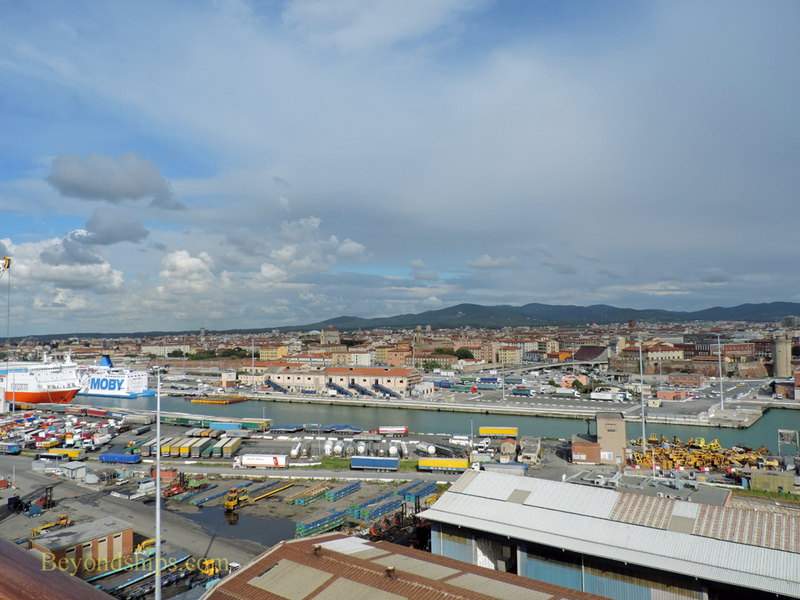 Although numerous cruise ships call in Livorno each year, the focus of the port remains its commercial and industrial operations. Large cruise ships dock at a container pier that is separated from the city by industrial facilities and busy traffic. Consequently, guests are not allowed to walk to or from the city. Smaller cruise ships can dock closer to the city near the ferry piers. While there are some things to see in Livorno (e.g., the old Florentine forts, the Venezia district with its canals), they cannot compete with those of Livorno's neighbors. 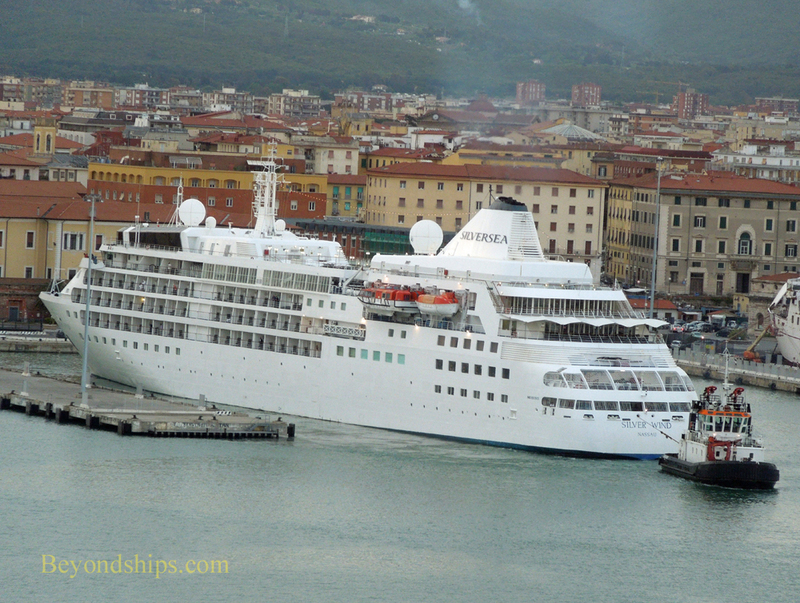 Therefore, most cruise ship guests just pass through Livorno to Pisa or Florence. Both Pisa and Florence are accessible by train. Shuttle buses from the port usually drop guests off near the Piazza Grande. From there it is about 1.5 miles to Livorno Centrale station. It is about a 10 to 20 minute walk or one can take the Bus No. 1 to the train station, which covers the distance in about five minutes. Trains to Pisa take between 15 to 20 minutes. Once in Pisa, you can walk to the Field of Miracles (20 to 30 minutes) or take a local bus. Florence is further away so trains to Florence (Firenze Santa Maria Novella station) take about an hour and a half. The station is on the edge of the historic area of the city. There are usually some taxis at the pier but they prefer to take customers on all-day tours. Cruise ships calling in Livorno typically offer a variety of excursions to Pisa and/or Florence. Above: Crown Princess pulling away from the pier in Livorno. 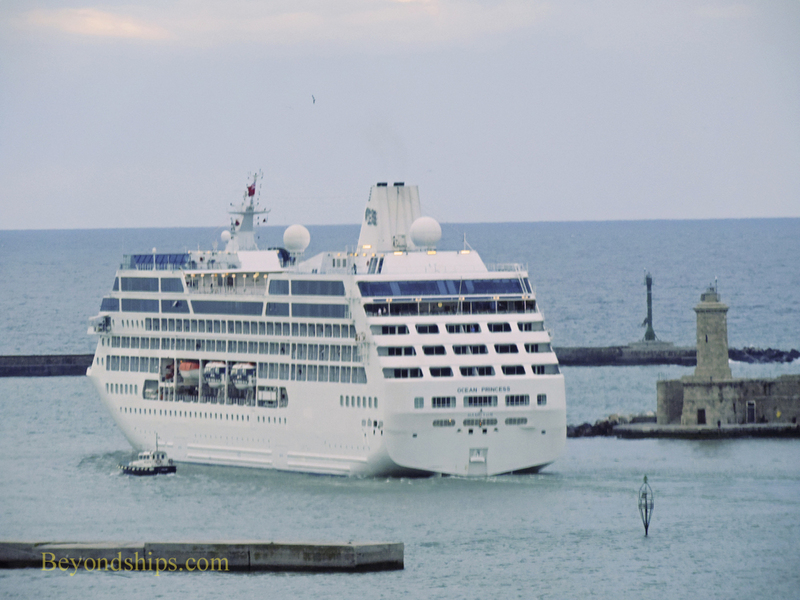 Below: Silver Whisper docked in Livorno. 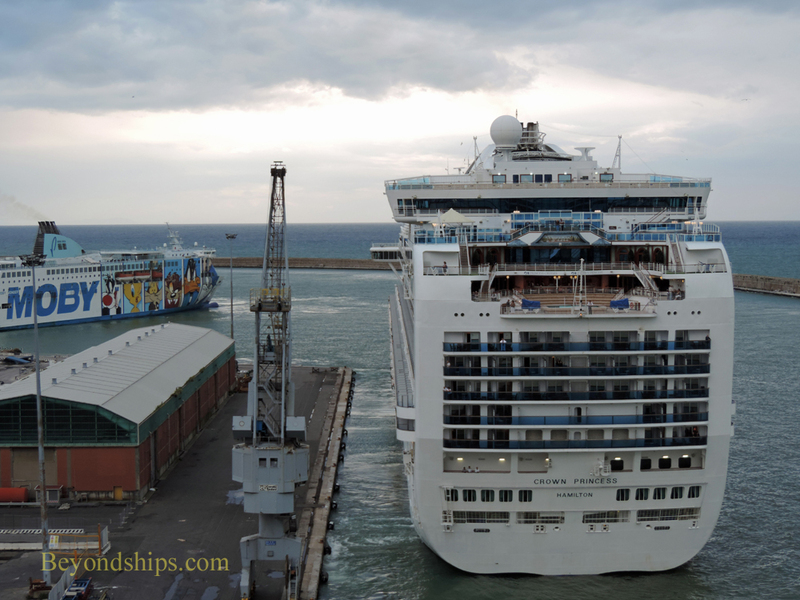 Above and below: Ocean Princess in Livorno.